The Roman Empire was adept at bringing water into their cities. Two thousand years ago Lyon was Lugdunum and the city is still surrounded with ancient Roman artifacts for transporting water into the city (and for removing sewage). 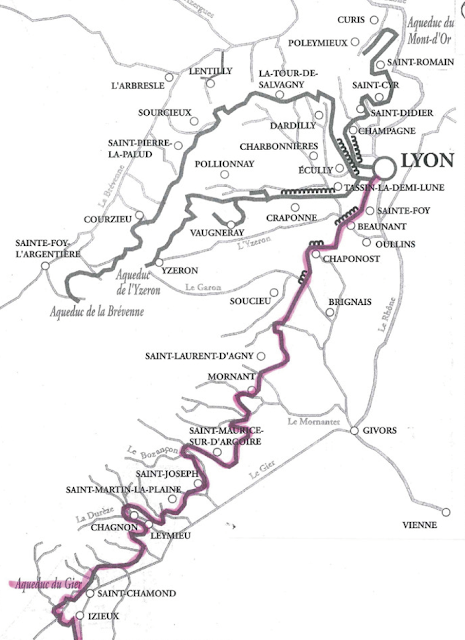 In the map below, we can see how the aqueduct descends from the Massif Central into Lyon. The aqueduct is surprisingly decorative. A layer of red brick is placed at every meter of elevation perhaps as a way of determining the height. Not only are there arches longitudinally along the aqueduct but also transversely on every pier. Some of these transverse arches are filled in and some remain open. The aqueducts must have been very attractive when they were first built with stones arranged as diamond shapes on the surface. This arrangement is called opus reticulatum (network) according to my copy of 'Guide to the Aqueducts of Ancient Rome.' These diamonds were actually pyramid in shape when they were new. According to the Guide 'aqueduct' is an English word without a Latin counterpart (the Romans referred to them as arcuationes or arcades). Besides the arches, an aqueduct includes walls for the lower portions as well as tunnels through the hills. In fact, the aqueduct at Lyon is famous for having several well-preserved syphons, with pipes that allow the water to descend and then rise again close to its original elevation. The Roman Aqueducts vary greatly in style across Europe and the Middle East. Readers can compare the aqueduct in Lyon with a photo of the aqueduct at Caesarea in Israel from my blog of January 27, 2009. The people of Lyon seem to have learned how to live beside all of the history that surrounds them. Where the aqueduct blocks a road it is removed while the rest of the aqueduct remains intact. Lyon is surrounded by so much Roman history that it has been designated a world heritage site by UNESCO. Still, these ancient structures appear to be quickly disintegrating and probably won't last another 2000 years. Readers interested in learning more about the aqueducts of Lyon can find many well-written articles on the Internet.